Be forewarned: as with any review or reflective piece, this is wrought with spoilers. For better or for worse, I am making my position on the new Star Wars film clear. I’ll start by explaining that there are two types of Star Wars fans: dabblers and live-ins. Dabblers watch the movies, sometimes, and maybe buy a Star Wars t-shirt or coffee mug. Live-ins watch, read, write, etc, and can cite various numbers of authors, titles and stories (not to mention countless film or book details word for word) from the series. The latter fans are now sitting in dark corners, sobbing their hearts out. Their world has been mercilessly obliterated. Star Wars has lost its heart. Probably the biggest thing about any Star Wars story (this is why the X-Wing or Bounty Hunter spinoffs were so-so) was the sense of nobility. Whether it was sith or jedi, there was always something noble. Sith were coldly noble, something like Alexander or Julius Caesar. Powerful and cunning and aloof. Jedi were Arthurian knights, noble brothers in arms following an honorable and ancient code. But that’s all gone now; jedi, sith, droids, tusken raiders, they all act the same. Everyone and everything acts base and bland. It’s that beautiful Hollywood principle of flattening the playing field, I guess. Next, Star Wars has turned to clichés and repetition. For a moment Han Solo brought his familiar, fresh feel and voice to the scene, but I guess the director got sick of letting him say non-bland lines, because a stop was quickly put to that. But what was with using the exact same lines to reintroduce the Milennium Falcon? Why did that even need to happen? Anyone watching the new film will either 1) know the ship already and be confused at how it got lost or why it was lost or what in blazes it was doing out of Han’s possession for so long or 2) not give a damn about spaceships and their general state and certainly not spare a thought about whether or not it is a bucket of bolts. Needless to say, there were many pointless lines that were directly stolen from the movies that directly prequelled this film. The Force Awakens uses countless recycled Hollywood lines (I mention this later as well) rather than original Lucas lines. This isn’t Die Hard X or Jurassic X. Logic was spilled all over the floor and swept under the carpet from scene one. The very first glance we get of the stormtrooper, he is stunned by the death of his comrade. He goes utterly haywire about it. But two scenes later, without any misgivings, he’s blowing his comrades-in-arms away willy-nilly from the secondary gunning seat aboard a TIE fighter. What happened to the trauma induced by his dying partner tracing a (as in a typical zombie scene) four-finger trail of blood across his visor? But I’ve moved ahead of myself here – the first issue started with the yellow text. Luke has run away for no good reason – he’s fled! He was confronted by darkness (he’s faced that before as he’s had to face his own father in combat) but this time he fled, and for some unexplained reason left a map to his whereabouts (a galactic easter egg hunt) which all his friends and family have to solve if they are to survive the onslaught of their enemies. Back in Return of the Jedi, Luke learned pretty darned well that fleeing was not the way to solve anything. All his friends got in big trouble when he left. So now he’s done it again? The next thing that confused me was the swordplay. Everyone is a master swordsman. Several duels occur during the movie, and somehow sith have fallen beneath even stormtroopers in martial training. Not to mention that the lady of the story (not Leia, although it was nice to see her back) was even able to master a selection of force maneuvers after knowing she had force attunement for approximately a single day. It took Anakin and Luke Skywalker many years to even slightly channel their abilities, even though they were two of the most powerful jedi later in their lives. And why is the rebellion only four wings of X-wings big? They lose nearly ten X-wings and then everybody’s screaming that half the fleet has been wiped out! They’ve had more than twenty years without the emperor or Darth Vader around to build up their forces and contacts. The Empire was in shambles at the end of Return of the Jedi. Not to mention that they never brought in any Y-wings for the bombing runs – X-wings can stock a torpedo or two that can replace a bomb in a very tight pinch, but Y-wings are actual bombers. Any Star Wars fan knows that! And Ben (although Disney, you ought to realize that his name was actually Jacen), switched between two ultra-odd modes. Without his helmet, he cried and cried and cried all the time (very sith of him). With his helmet, he became stronger but for some reason his voice modulator was perpetually broken; it was nigh on impossible to understand anything he said. It’s not like he has voice issues like Anakin had when his body had been ravaged by flame until he had to be reconstructed, so what was that all about? I can go much, much further into logic issues here, but I’d better leave the rest up to you to find for now. This post would be a few thousand words longer if I included them all. Acting. I’m not sure if this was due to the Star Wars acting competitions or not (budget talent), but so many of the actors appeared to be over-dramatizing non-dramatic scenes (adding unnecessary melodrama). Wide eyes, tense voices, urgent attitudes, all the time. Even in the dead calm of desert solitude, Rey acts sullen and pouty. Why? She might have been apathetic or losing hope. She instead looked like she just got rejected from… cheerleader tryouts? I’m glad for everyone who got to act in such a once-beautiful franchise, but maybe they could have used some direction and/or makeup? This wasn’t the first draft of a web series or a new series. It’s a new instalment into one of the most highly-acclaimed sci-fi franchises in existence. The canon decanonization was a brutal slap-in-the-face. Timothy Zahn wrote some absolutely epic books for Lucas. The Hand of Thrawn trilogy, to name one series. Jude Watson also wrote fantastic stories for Star Wars. Is Disney really so illiterate that its people cannot take good stories from the existing canon and have to instead blacklist them as unofficial to make their own (severely lacking) story stand on its own feet? Timothy Zahn already laid out thrilling, logical, exciting sequels to Return of the Jedi. The material was there. The story was simple. Instead, Disney scrunched lines from Die Hard and Taken and Jurassic Park (“you’re keeping raptors here?”) and other thriller films and needlessly crammed them into Star Wars. Star Wars didn’t need recycled lines. Words aren’t about to add to global litter or anything. People may have groaned at Lucas for some things, but originality was never one of those reasons. Will I say anything good about the new film? Sure. The landscapes were gorgeous; the desert panorama of wrecked destroyers, for instance, was simply breathtaking. But concept artists have always done a good job. Seriously. And effects are pretty run-of-the-mill now – they stopped being special after The Matrix 3 and Transformers. So come on, Disney: was this a joke? Should I have left the cinema laughing? Honestly, I’m not generally one for crying, but this brought me pretty close. You’ve trashed the most fantastic sci-fi & fantasy universe that was ever realized. Just knowing that you’re in the process of making further sequels is carving me up inside. George Lucas, please… can’t you take your work of art back? I adored Star Wars. I did a pre-release post, but now it’s time to ponder the game in all its finally-experiencable glory. First impression: wow, this is amazing. Everything feels epic and looks beautiful. A few hours later: this is impressive. And fun. Oh wait, is that level 20 griffon supposed to be circling poor little level 4 me? That’s… disconcerting. Ultimate realization (days in): can’t leave my computer. Can’t take off my headphones. Can’t even go outside or get food. Must take another witcher contract… and another… and another! The Witcher 3 wanted to market itself based on the size of the world and the effects of quest choices you make. That would be all good and well, but while the choices and effects are interesting, the world feels super small. Granted, it’s probably bigger than all the worlds of other fantasy games that exist, but I’m a huge sucker for exploration. It’s mildly depressing to look at the map and see that the chunks of the world I can explore are only tiny little snippets of the world map. Seriously! But back to choices and effects. The Witcher 3’s choice system openly demonstrates that Mass Effect (and BioWare in general) has quite a lot of room for improvement. I knew choices could be presented well in games, and CD Projekt Red has stepped boldly in the right direction. It’s refreshing to 1) not be making massive, spontaneous ultimatum choices, and 2) to occasionally not even witness the effects of positive or negative choices until later. I’m impressed. And possibly bewitched. The game engine is well-optimized, and patches to improve things keep coming out. Not even sure why! Makes me think back to when I bought Assassin’s Creed Unity. The support chaps told me my computer simply wasn’t good enough. Funny that, because The Witcher 3 (much newer, and definitely prettier) runs like a charm on my rig. The gameplay is good. Granted, it’s not perfect, but it’s close. Running, riding, hunting, swimming, diving, sailing, all seamlessly joined. The time of day changes. The weather changes. Combat is streamlined (so long as Geralt has figured out that he’s in combat). The world feels diverse and interesting because of the freedom of movement and the interaction. The one main downside to gameplay I’ve noticed so far is fall damage – if you trip over for some reason, don’t be too surprised if your health bar is cut in half. The music for The Witcher 3 puts a good chunk of other games to shame. As much as I enjoy Jeremy Soule music, I don’t really think that fantasy should be dominated by orchestral music. So The Witcher 3 was a splendid change. Most of the score consists of Slavic-style folky tunes that capture the heart nearly as well as they capture the setting. Battle music is some of the best, but the three crones (no spoilers) are accompanied by the best tune. You’ll know when you hear it. Think dark, dark fairy tale music. Questing is a real treat in The Witcher 3. There are regular quests that involve talking to people, finding people, killing people, and making choices. Pretty much every game has them. In The Witcher 3, though, we get to watch Geralt’s reaction to these quests. Fetch quests? Geralt doesn’t care much for being a delivery boy. Talking to people? He’s got a hilarious overdose of sarcasm that makes conversation amusing and interesting. Killing people? In style. Making choices? Fun mystery boxes of “what does this button do?” conundrums that make you pay attention. Don’t skip conversation if you want to make intelligent choices. Seriously. Your choice can be as clear as “Mhm”, “Really?”, or “I’ll commit myself to every word you just said and that is my final choice and so much for the other conversation options that would have saved my good friend such-and-such”. Sarcasm aside, I’d list that as a gameplay strength. But those are just the regular quests. 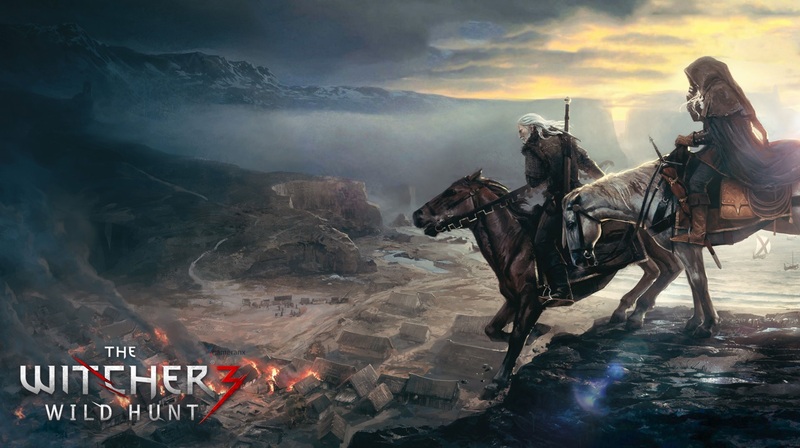 In The Witcher 3, you also run into witcher quests – or, more specifically, witcher contracts. These are brillant combinations of hunting and mystery-solving. Geralt is equipped with a marvelous dose of Sherlock Holmes. He has remarkable senses that allow him to pick up details like what kind of liquid has been spilled, what type of claws gouged a wall, or even what kind of blood is at the scene. To accompany these skills, Geralt unashamedly talks to himself. A lot. Good for him, I say. But this sense-and-talk combination makes for interesting puzzle-solving. Geralt starts by talking to witnesses, then moves to investigate the scene, and then (often) follows a trail. Along the way, he spots clues that tell you what you’re going to find, how and where you’re going to find it, and usually also inform you as to how you’re going to need to defeat whatever it is. Hunting quests in this manner are a massive improvement to fetch quests or general kill-the-creature-that-lives-in-the-cave quests. It’s also interesting to learn about each little town and place through the monster(s) that plague the people there – for instance, wraiths appear when people have been cruelly murdered or wronged. Relationships. Ultimately, you could say that The Witcher 3 does relationships like Assassin’s Creed does combat, which is to say that it’s simple enough if you know the buttons. However, it certainly isn’t Mass Effect’s yes-or-no relationship dialogue options. And the fact that you are playing a solid character makes the relationships more meaningful. Shepard was, well… a husk (pun intended) of a character. Geralt certainly isn’t. The Witcher 3’s scenery is gorgeous. Fantasy at its finest. Ornate tomb carvings. Sprawling, grassy hills. Flocks of sheep, mobs of horses. Roaming giants. Ruins. The textures were done well. And the game’s musical score complemented the setting perfectly. Charming, haunting, old-Scandinavia-esque melodies. Tracks that make perfect companions for traveling, hunting, and doing grim battle. But don’t expect perfection in every way the game looks. For some reason, 95% of Geralt’s armor options more or less completely fail to please the eye. Heavy armor is accompanied by a giant, round wok (yep, a Chinese frying pan) over the character’s belly. Light armor is bulky and has clipping issues with collars. Medium armor has great textures underneath – but is padded with ugly outer jackets that seem to always have the worst possible color combinations. The only chest armor that I have actually loved so far is the first one I ever crafted – the Warrior’s Leather Jacket. That brings us to crafting. CD Projekt Red boasted that the crafting system would be innovative and interesting; it’s okay, I suppose, but nothing amazingly special. I will say this for it, though – I really appreciate the fact that once you craft a potion or oil, you never have to go scouring the land for ingredients again. Oils have inifinite use (which makes sense, given the amount you would use on a blade in the game). Potions and bombs have charges that replenish when you meditate (although this consumes hard alcohol in your inventory, so you gotta load up your pack like a boozer). Other than that, crafting is average. Find or buy materials, go to a craftsman with sufficient experience, craft or smith the items you have learned about. Swords generally look okay (certainly not as bad as armor), so it’s mostly about picking the best stats. Silver swords have worse skins than steel, but they’re still okay. In conclusion, The Witcher 3 is a lot of fun. If you love wandering across open landscapes and hunting dangerous monsters, this game is totally for you. It’s certainly for me!